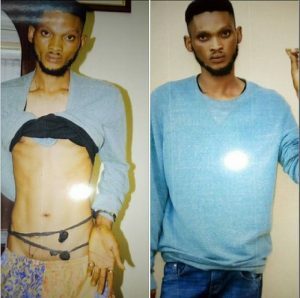 An alleged notorious criminal whose specialty is in robbing students of their phones on Campus has been nabbed by vigilant Security Operatives of the Internal Security Unit of the University of Calabar, Cross River state. The culprit, Daniel Kelechi Christian, a native of Abakiliki in Ebonyi State and Second year student of the Political Science Education Unit of the Department of Social Science Education, University of Calabar was arrested on Friday afternoon at the “ Malabor Republic” of the institution. Daniel Christian identified by the Security Unit as a Cultist and former Special Assistant (SA) to the immediate past president of the Student Union Government (SUG), has been on the ‘waiting list’of both the Security Unit of the University and the Cross River State Police Command. Prior to his arrest, Daniel Christian was reportedly involved in the last known cult attack on campus and in an attempt to escape arrest fired gunshot at Security Operatives and unfortunately for him, the locally made pistol exploded inflicting wounds on his left hand nevertheless he managed to scamper for safety. Daniel who has confessed to be involved in various robbery incidents in the past, on sneaking again into campus was linked with another phone robbery last week. As at the time of his arrest, he was decked with items suspected to be charms on his waist (odeshi) and 4 magical rings on his fingers.